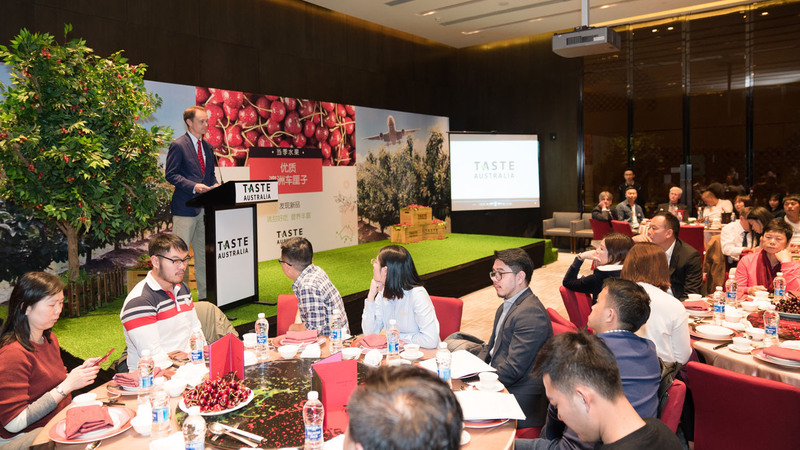 Australian horticultural export brand Taste Australia recently held trading events in Shanghai and Guangzhou, during the leadup to China's Spring Festival holiday, for which premium imported cherries are a popular gift. It's the first season in which mainland Australian cherries have been allowed to be shipped to mainland China by air freight. 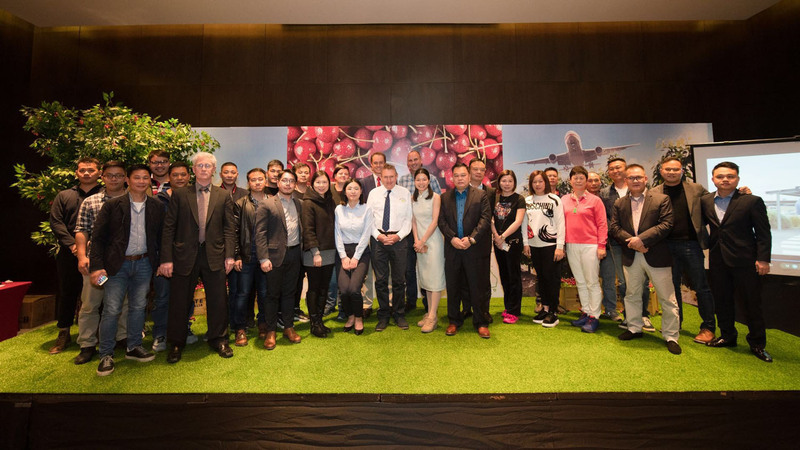 One of Taste Australia's key messages for this season is the 96-hour transit time from Australian packer to arrival in China afforded by air freight shipment, and the resulting freshness of the cherries. In attendence at the Guangzhou event were Paul Sanda, Deputy Consul-General from the Australian consulate in Guangzhou; Tom Eastlake, President of Cherry Growers Australia; representatives from the state government of Victoria; representatives from the state government of New South Wales, Australian cherry growers; Mr. Zheng Nansen, the CEO of fruit operation in Guangzhou's Jiangnan Wholesale Market and importers. The Shanghai trade event, at which Produce Report was present, was also aimed at fruit traders. 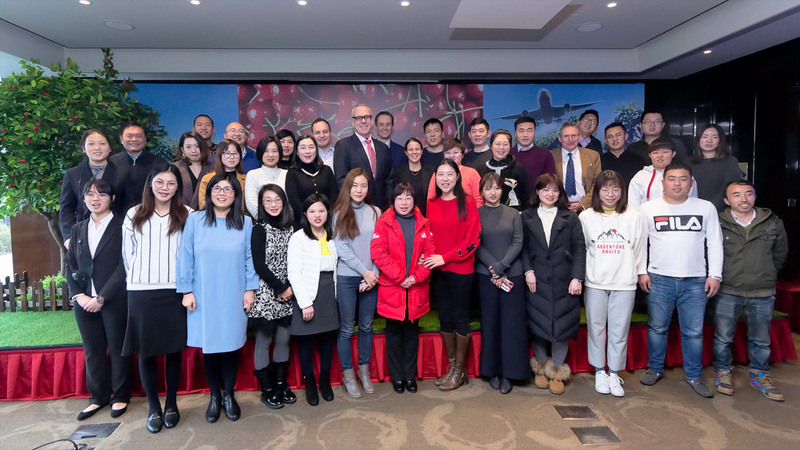 Roughly 40 people were present at the event, including Karen Surmon, Trade Commissioner at the Australian Trade and Investment Commission; Tom Eastlake, President of Cherry Growers Australia; representatives from the state government of Victoria; Australian cherry growers; representatives from Shanghai's Huizhan Market; importers; and fruit ecommerce operators. Australia gained market access to China for fresh cherries in 2013, following the signing of phytosanitary protocols. But at first only Tasmanian cherries were allowed to be sent to China by air freight, due to concerns over fruit fly infestation in mainland Australia fruit. Mainland Australian fruit was required to undergo cold treatment at sea, during a total 21-day ocean voyage. This essentially shut mainland Australian cherries out of China. But in November of last year, Chinese and Australian government authorities struck a deal for greater market access to China for Australian fruit, including an agreement to allow air shipment of mainland Australia cherries to China. This gave suppliers a large part of last year's season to figure out logistics and plan sales and promotion, in order to pave the way for large shipments this season. "Australian cherries are grown across six states which have combined annual production of 16,000 tonnes," wrote Taste Australia in an official statement accompanying the events. "Victoria, New South Wales and Tasmania are the largest producing regions and each have complementary supply window and varieties." Tom Eastlake of Cherry Growers Australia said that about half the total production volume is expected to be exported this season. Produce Report spoke to Managing Director of the Dorrens Valley Orchard, Tony Hannaford, who grows cherries in the Adelaide Hills region of South Australia. While he has already exported 100 tons of cherries to China by air freight so far this season, Hannaford said that as this is the first season, his team is focused for now learning and accumulating experience in exporting to China. He noted that because air freight shipments arrive in China very quickly, it is essential to establish timely communication channels with the recipients in there. Hannaford came to China this time to meet and negotiate purchasing agreements with potential new buyers. With a lower volume and higher price than some of the other counter-seasonal cherries on the market in China, Taste Australia has apparently chosen to focus on highlighting the high level of freshness, excellent fruit quality, and pristine growing environment of Australian cherries—especially the freshness stemming from the air freight shipment. According to Karen Surmon of the Australian Trade and Investment Commission, air fright is the only method used to ship Australian cherries to China, with no ocean shipments at present. "Thanks to the proximity between Australia and China, cherries can arrive around 96 hours after being picked," stated Taste Australia. "This is the quickest arrival time of any counter-seasonal supplier of fresh fruits, which shows the incomparable freshness of imported fruit from Australia." As for this season's Australian cherry quality, "the conditions of the 2019 cherry crop to date has been good, with high brix levels, satisfying firmness, and generally bigger in size, which has meant a favourable tasting profile for Asian markets. As a highly welcomed premium fruit, there is always limited supply especially as production only takes place from October to February each year. This makes it important to order early to meet consumer demand, especially during Chinese New Year holiday season." Under the China-Australia Free Trade Agreement, as of January 1 of this year, Australian cherries can be imported into China with zero tariff.